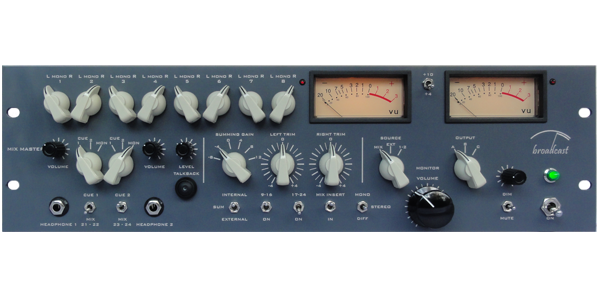 With even more level range to allow driving the front end of your amp harder. With tone control – treble boost and cut! Just like the missing link the unit has universal XLR inputs ( both male and female connected in parallel ) – no more hunting around for gender changers. Also allows the source to loop through the unit to give you a signal split. Dual outputs for sending to two amps or two channels of one amp. 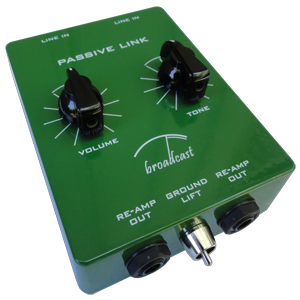 Ideal interface to connect your guitar effects pedals and old tape echoes to the line level outputs from your recording system. Featuring main stereo inputs and additional cue input. Cue input available as a balanced XLR or as a 3.5mm socket for connection to iPad, smartphone etc. Super loud, low noise, low distortion amplifier. Universal microphone stand adapter in the base. 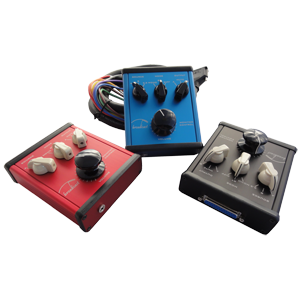 All our stereo monitor controllers feature the same passive audio path and core switching system. From input to output there are no electronic components to impact on the audio quality. 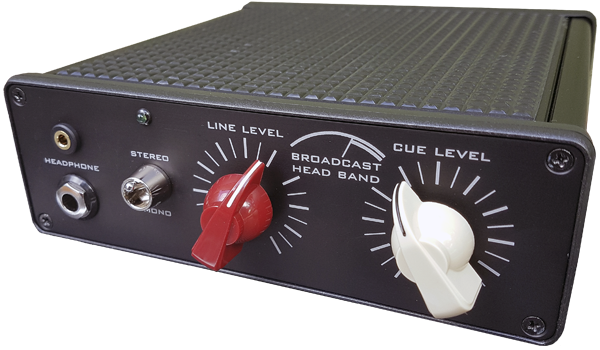 Using precision continuous attenuators that achieve a left right balance within 0.5dB over it’s range and robust switching, Broadcast’s Monitor Controllers offer uncoloured, transparent quality reproduction at the critical juncture between your mix and your monitors. All our monitor and summing mixer systems utilise your system’s high performance balanced input and output devices and interpose the minimum path to maintain audio integrity. Broadcast produces three standard monitor controllers. We also design a custom monitor controller for your specific application and setup. For connection to three sources including a 3.5mm socket on the front edge and two balanced sources with outputs to two pairs of monitors. All balanced audio is presented a industry standard Dsub connector on the rear. We can supply a standard four metre breakout cable to XLRs or custom wire one to your specifications. For connection to three sources including a 3.5mm socket on the front panel and two balanced sources with outputs to two pairs of monitors. For connection to three balanced sources with outputs to three pairs of monitors. Drawing from a selection of high performance audio modules you can design and layout your own Monitor Controller and we’ll supply it. ……. couldn’t be more perfect. Hi Rob, I just got the Passive Link a couple of hours ago in perfect shape. I plugged it from my MOTU 896HD, to a 50 Watt Marshall JCM800 combo, hit play and wow, AMAZING. Great sound, total control. Thank you for making this great product, you just saved us a lot of pain and totally changed the way we record guitars, bass, and we’ll see what else. The Translator, Simplifier, Hard On and Missing Link are no longer made except by custom order. However we continue to provide technical support to all our products.